Put the coconut milk and coriander in a food processor and blend. Strain the mixture using a fine sieve and discard the coriander. Heat the oil in a large, non-stick wok or saucepan and add the curry paste and chillies. Stir-fry for 2-3 minutes and then add the chicken. Cook for 5-6 minutes or until the chicken is sealed and lightly browned. 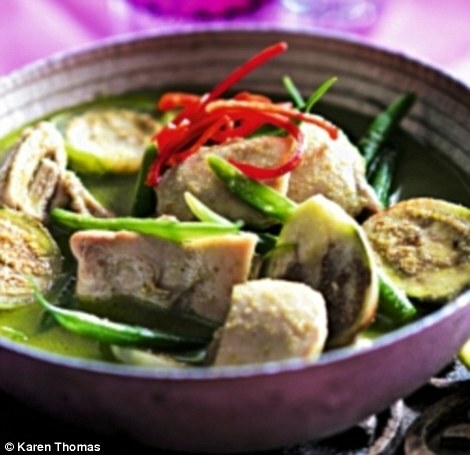 Stir in the coconut milk mixture, stock, lime leaves, fish sauce, palm sugar and baby aubergines. Simmer uncovered for 10-15 minutes, stirring occasionally. Add the green beans and fry on a low heat for 6-8 minutes. Remove from the hob and stir in the lime juice. Serve with steamed rice and garnish with red chilli.